For Valentine's Day this year I am going to make a pretty little Tea for Two. 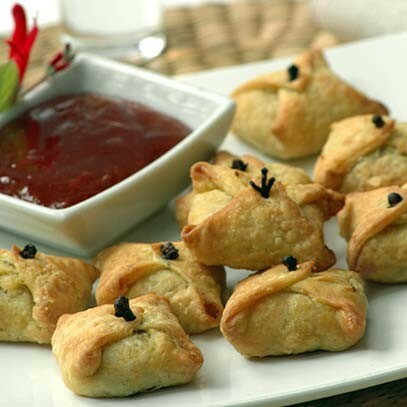 Red Velvet cupcakes, mini custard slices, teeny sausage rolls and "WASGOEDBONDELTJIES" (translates to "laundry bundles - a square of pastry with a savoury filling, the corners of the pastry are then folded to the centre of the "pie" and secured with a whole clove - like an envelope). The tea table will be adorned with a simple fuschia pink square linen cloth, and a 50cm x 50cm granny square overlay made with Stylecraft Classique Cotton DK. I love the mix of pinks and purples with the pop of yellow in between. I made a few GRANNY HEARTS which I intend to use to decorate a very plain white three tier cake stand. 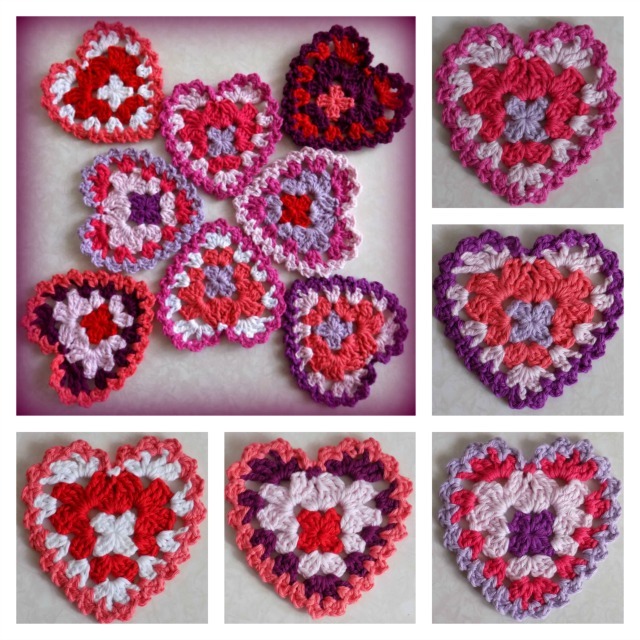 The hearts are very easy to make and are a fun way to use up scraps from bigger projects. The Poppy, Shell Pink, Mauve and Shrimp heart is my favourite! What colour combinations would you choose to make the hearts? My theme for this year is to "Keep it Simple" - from cooking and baking, to decor and clothing and (most importantly) crafting! In keeping with this I kicked off the year by making some new washcloths for the bathrooms. 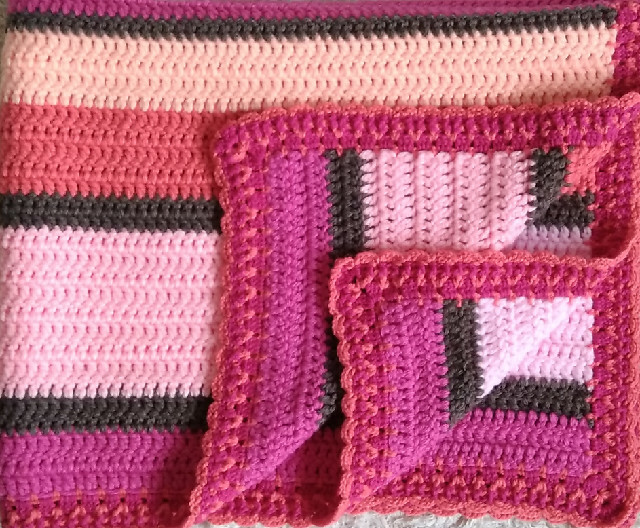 The beauty of a neutral room is that you can really go to town with colourful accessories, and this is what I did with the first set of Continuous Solid Square washcloths. These little cloths are super easy to make. They are worked in the round and are therefore much easier to edge than cloths worked in rows (deciding where to put your stitches is always a bit of a bother). Walking on the beach one morning after a storm, hubby spotted this lovely big shell. It was a sickly shade of green and covered in barnacles. I cleaned it up over a few days and now occasionally use it as a soap dish! 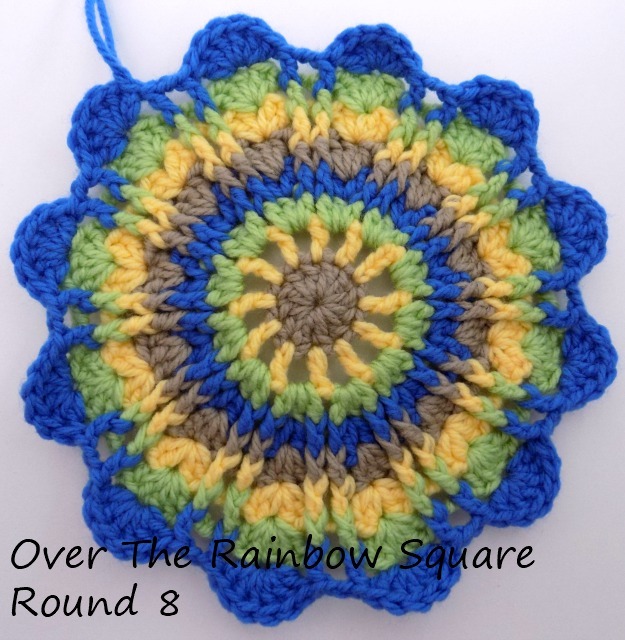 Working in a spiral (for whatever shape) is particularly useful for crocheting with variegated / colour change yarns. When working a motif where you end each round and then begin a new one, you will notice that your colour changes do not match up. Instead of the colour flowing throughout the motif, each round ends with an abrupt colour change, which then starts again a row higher...... so you have a definite division (or stepping) of colours. Dedri Uys (Look At What I Made) has made a brilliant tutorial for this technique HERE. Round 1: 6ch, [(3dc, 3ch) x 3, 3dc into circle], 2sc into 6ch...... and then follow Dedri's tutorial for the next 9 rounds (ten rounds in total). I used a simple 2 round "ribbed stitch" for the edging. This makes for a sturdy edging that helps the cloth keep its shape. Round 11: alternate Fpdc, Bpdc stitches around each dc; into corners work 2dc, 2ch, 2dc. Round 12: work Fpdc around Fpdc; Bpdc around Bpdc, into 2dc corners of Round 11 alternate Fpdc, Bpdc in keeping with the "ribbed" sequence; into 3 corners work 2dc, 2ch, 2dc; into 4th corner work 2dc,20ch, 2dc. Crocheting washcloths has become a bit of an "end of old - / start of new year" tradition for me (2016 and 2015 ). I love being able to start the new year with a tidy stash and a heap of neat little washcloths to use or gift. I hope that you will enjoy making these as much as I did! 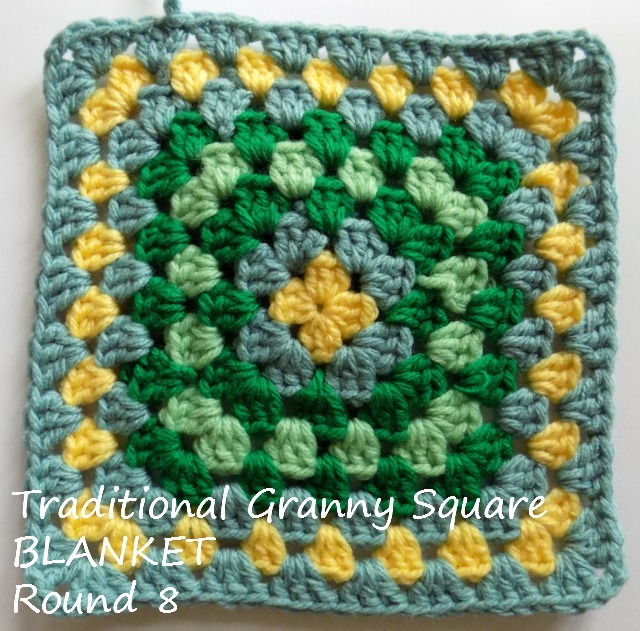 This week we will be crocheting a neat little border around our blankets. 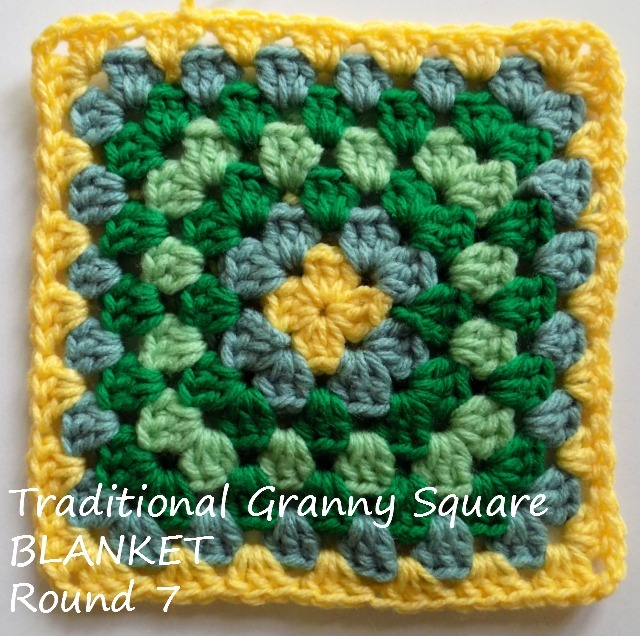 It is not too late to join in - the patterns will remain on my blog. YARN: Elle Charity Chunky (12 ply). Stylecraft Special Chunky is an excellent quality / great value alternative yarn. ZOOTY’S TIP: I use a hook 1 size smaller (5.00mm; H/8 US or 6 CANADIAN) to work my border and edging. Individual tension may affect the “straightness” of the border. NOTE: Gauge is not too important with this project. Yarn thicknesses vary somewhat from brand to brand as do the tensions of individual crocheters. The most important thing is that your tension remains even throughout the project. 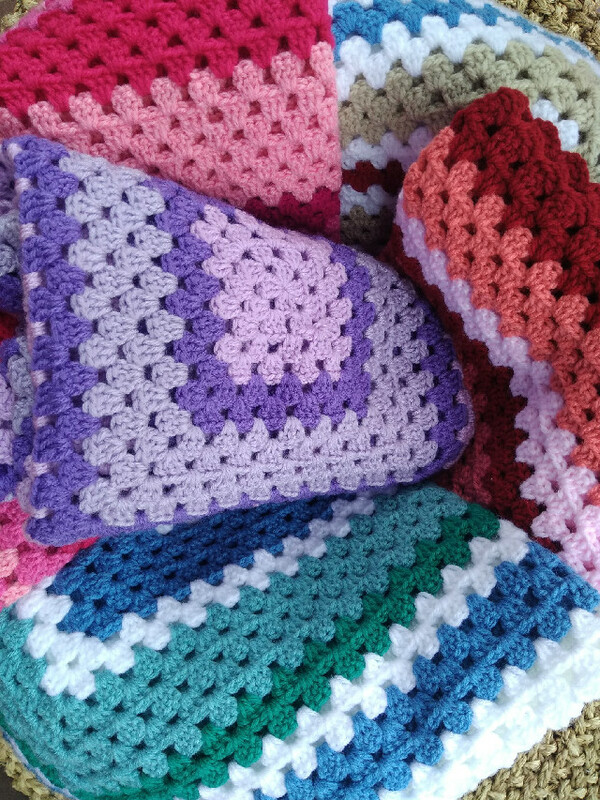 COLOURWAY: Each crocheter may choose his / her own colour layout - colour changes / breaks are suggestions only. Border and Edging is worked on the RS of your work. 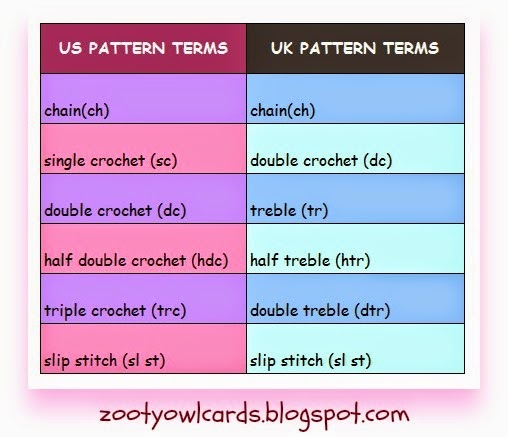 IMPORTANT: Read through pattern before starting to crochet. Dc Spike – double crochet spike "Explanation and How to"
To obtain a straight border each corner space counts as 1 stitch. Each join counts as 1 stitch. It is essential that you have an even number stitch count at the end of Border Round 1. Stitch counts must match for the right side and left side. Stitch counts must match for the top and the bottom. After you have worked the border along the top of the blanket, lay your work flat. If you have any “wave” you will need to reduce your stitch count (remove an even number of stitches by removing evenly spaced stitches worked into joins). If you find your work is “puckering” you will need to increase your stitch count (increase by an even number of stitches by working an additional stitch into evenly spaced joins). 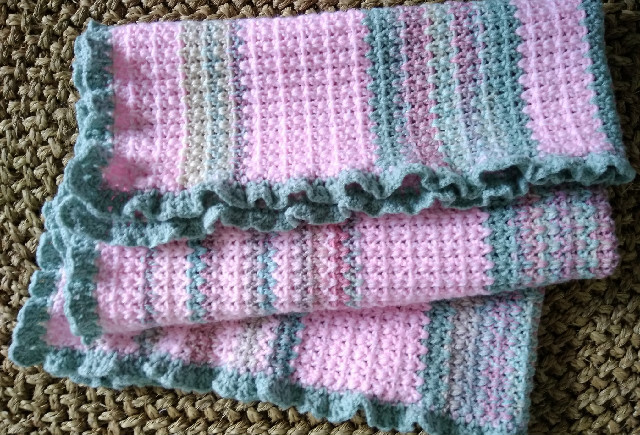 Make sure you duplicate any increase or decrease of sts when working along the bottom of the blanket, as top and bottom stitch count should be the same. Repeat the process after you have worked along the left side of the blanket. Make sure you duplicate any increase or decrease along the right side of the blanket, as stitch count for each side should be the same. vertical stripe: **1dc around post of first row, 2dc around post of next row** repeat from **to** around posts of the rest of the edge stitches, ending with 2dc around post of last dc row, 1 dc around post of sc row, last square, 1dc in corner, 1dc in each st across to the top left hand corner (2dc, 2ch, 2dc). 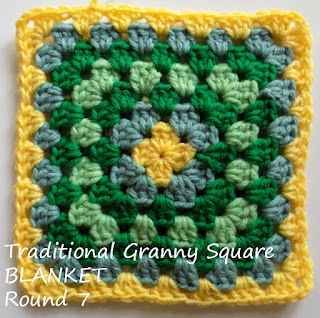 Continue down left side of the blanket, work 1dc into the top of each st, when you reach a corner on a square 1dc into corner, 1trc into loop of join, 1dc into corner on next square. Repeat across all squares. (2dc, 2ch, 2dc) into bottom left hand corner. Work along the bottom repeating instructions as for top. Work up right side repeating instructions as for left side and end with a sl st into standing dc, fasten off. Round 2: Work a standing dc into any dc on any side. 1dc into each dc along all four sides; (2dc, 2ch, 2dc) into each 2ch corner. Ending with a sl st into standing dc. Fasten off yarn. Round 3: Work a standing dc in top right hand corner 2ch; (1dc, 2ch, 2dc) into same 2ch, *skip 1sp, 2dc into next sp (you are skipping 2dc each time)* repeat *to* to next 2ch corner (2dc, 2ch, 2dc). Repeat along all four sides ending with a sl st into standing dc. Fasten off yarn. Round 4:. Work a standing dc in top right hand corner 2ch sp. (1dc spike, 2ch, 1dc spike) into corner 2ch of Round 2, 1dc into corner 2ch *skip 2dc, 1dc into space between 2dc group, 1dc spike into sp between dc of Round 2* repeat *to* to next corner, 1dc into 2ch corner, (1dc spike, 2ch, 1dc spike) into corner space of Round 2, 1dc into 2ch corner. Repeat along all four sides omiting last corner. Sl st into standing dc. Fasten off yarn. Round 5: Join yarn in any dc, ch 1, work a rsc into each dc. Into each corner 2ch space work 3rsc. Sl st into first rsc. Fasten off yarn. 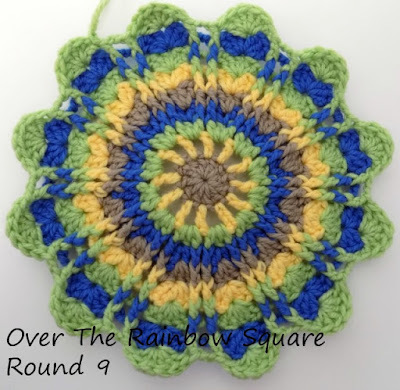 Hello Rainbow CAL-ers and welcome to Part 8 of the Rainbows After the Rain Blanket CAL (which I am hosting with Andrea of Kokopelli. While reorganizing my craft room two weeks ago I pulled out a few odds of DK blended yarns to make a blanket based on the RAR layout. 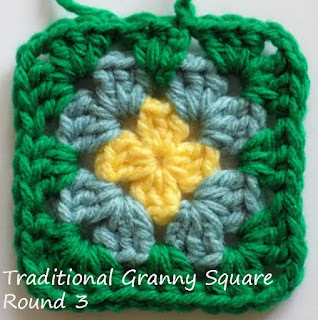 I replaced the Some Days Are Diamonds squares with 4 round traditional granny squares; the Bring Me Flowers Squares with 4 round solid grannies; and the Over the Rainbow squares with large granny squares. 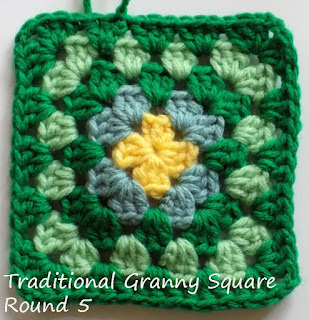 As long as the replacement squares are the same size and have the same end stitch count it is very easy to fit them into the design. Part 8 is the penultimate instalment of the Rainbows After the Rain Blanket CAL. This week we will be completing the centre panel (Over the Rainbow Squares and stripes) and joining all the panels together. Still to follow: Part 9 (Final) - 5 September 2017. Border and edging. STRIPES are worked alternating right side and wrong side of your work. 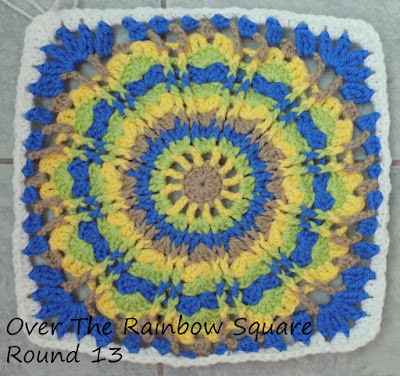 Following the Rainbows After the Rain Blanket Layout decide on the placement of your two Over the Rainbow Squares. We will refer to the two squares as “top square” (TS) and “bottom square” (BS). This distinction is particularly important where you have a specific colour placement. 2 sets of stripes are crocheted onto each Over the Rainbow Square, giving you two short panels which are then joined together to form the centre panel. Row 2: Join yarn in 1st dc on RS with a standing dc. 1dc into each of next 38sts. Fasten off. Turn work. Rows 3 – 8: Repeat Row 2 (continuing to alternate between RS and WS). JOINING: We will be using my VISIBLE JOIN METHOD which is explained in more detail HERE. The VISIBLE JOIN is a very forgiving joining method, which gives you a pretty “stitched” look on the right side of your work. (This join is especially useful when joining squares with uneven stitch counts or for crocheters with uneven tension). Join yarn with a standing sc through the first dc of both panels. 3ch; skip next 2dc, 1sc into next sp between dc, 3ch; *skip 3dc posts, 1sc into next sp between dc, 3ch* repeat *to* 10 times more; skip 2dc, working final sc into last dc of both panels of 8th row. 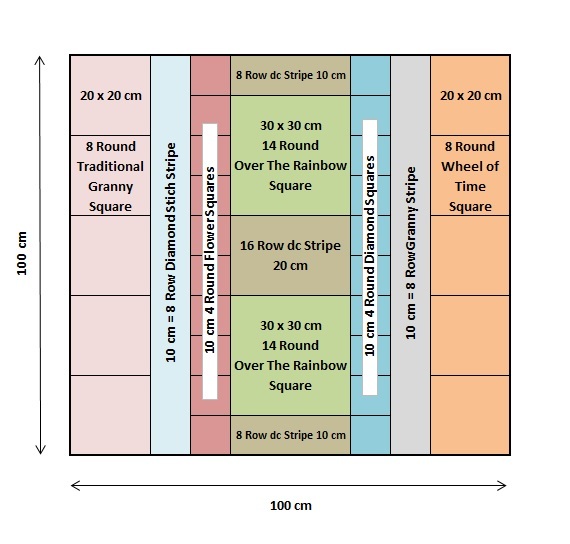 Last 8 horizontal stripes – line up with 10cm square 10. To obtain a stitch count equal to that of the side panels, we will crochet a single crochet foundation row along both sides of the centre panel. 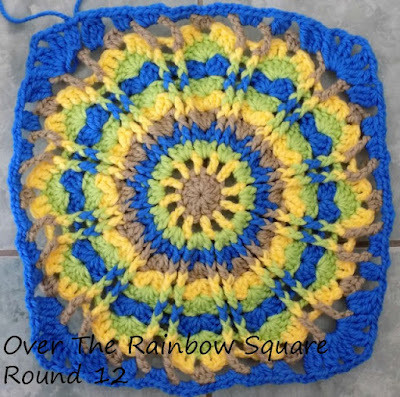 NOTE: In the foundation row as well as working into the sts of the “Over the Rainbow Squares” you will also be working along the sides of the horizontal stripes panels. The sc will be worked around the “dc post” stitches at the end of each row. 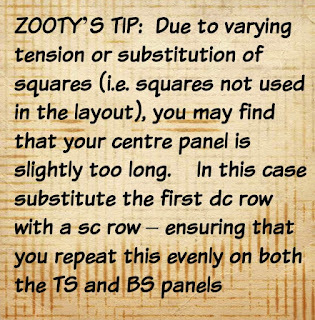 With RS of panels facing inward join the Some Days are Diamonds Panel to the centre panel, Join yarn in 1st sc of foundation row with a standing sc through both panels. *2ch; skip next sc, 1sc into next sc* repeat *to* to end, working final sc into last sc of foundation row. 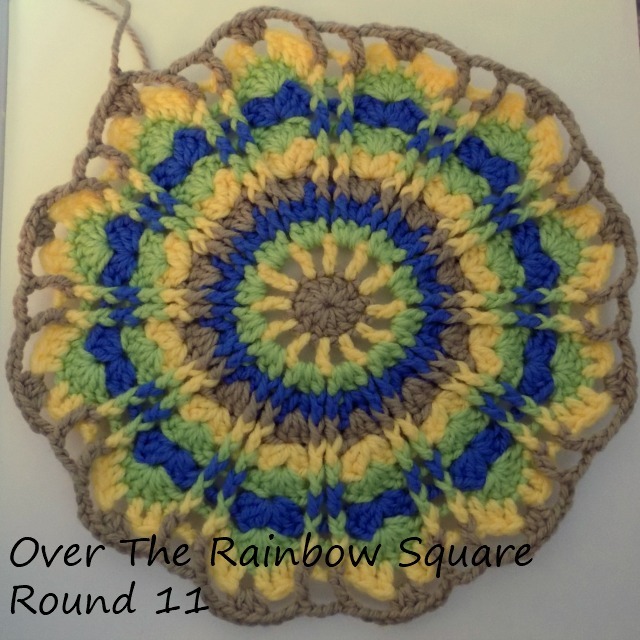 With RS of panels facing inward join the Bring Me Flowers Panel to the centre panel, Join yarn in 1st sc of foundation row with a standing sc through both panels. *2ch; skip next sc, 1sc into next sc* repeat *to* to end, working final sc into last sc of foundation row. With RS of Panels facing inward join the foundation row of the Vertical Granny Strip to the foundation row of the Some Days Are Diamonds strip. 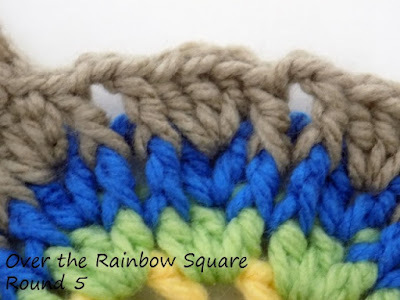 Join yarn in 1st sc of foundation row with a standing sc through both panels. *2ch; skip next sc, 1sc into next sc* repeat *to* to end, working final sc into last sc of foundation row. With RS of Panels facing inward join the foundation row of the Vertical Cobbled Pathways Stripe to the foundation row of the Bring Me Flowers strip. 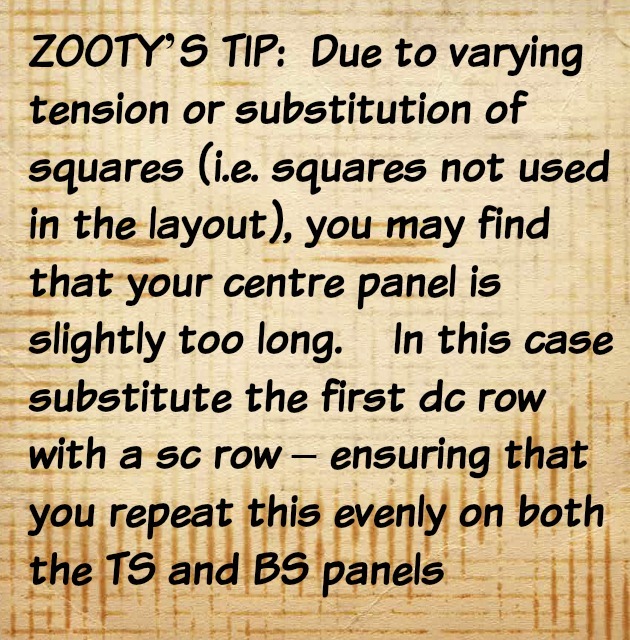 Join yarn in 1st sc of foundation row with a standing sc through both panels. *2ch; skip next sc, 1sc into next sc* repeat *to* to end, working final sc into last sc of foundation row. 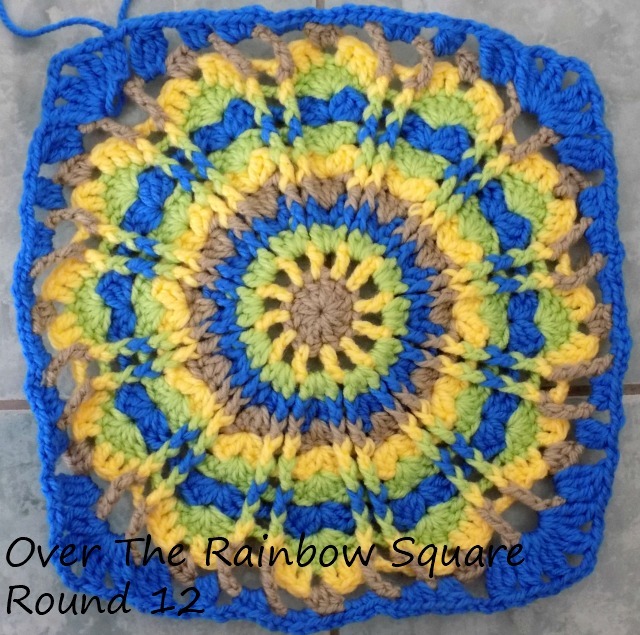 Your squares are all looking pretty amazing so far - and I can almost not wait to see the finished projects! 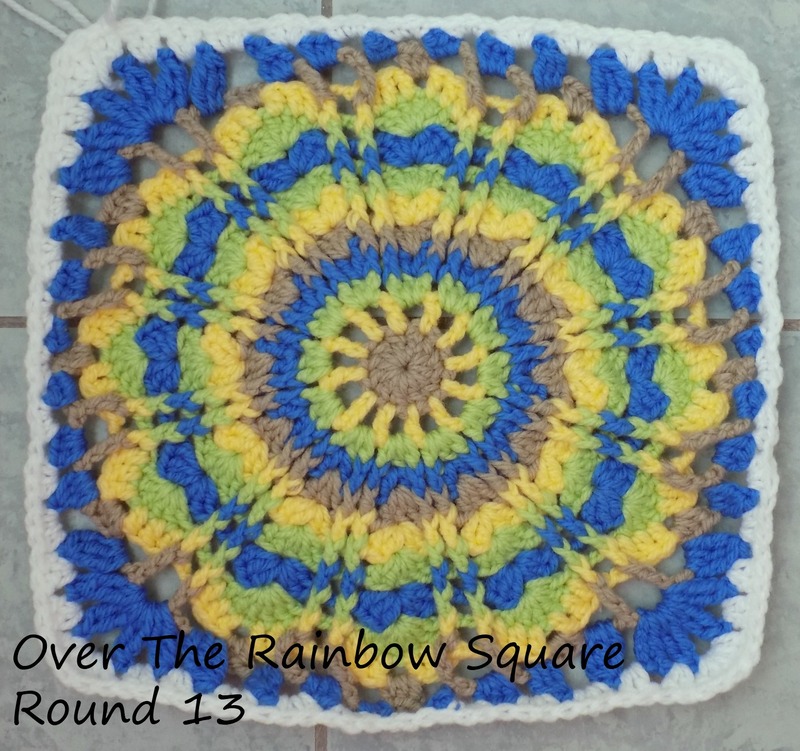 The OVER THE RAINBOW SQUARE is exactly the same for both the Blanket and the Poncho - 30cm x 30cm. 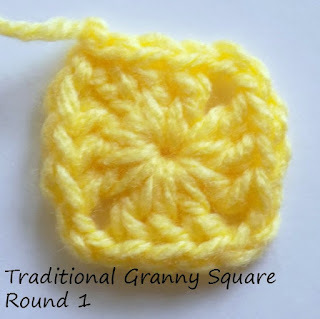 NOTE: The size of your square will depend on your choice of yarn thickness and hook size. 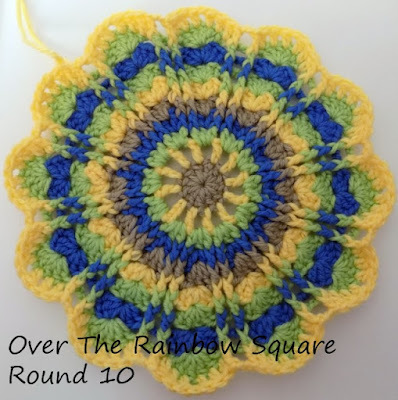 Should you choose to work exactly according to the RAINBOWS AFTER THE RAIN BLANKET or PONCHO layout, simply repeat the final round of the pattern until the square measures 30cm x 30cm (12 inches x 12 inches). Gauge is not too important with this project. 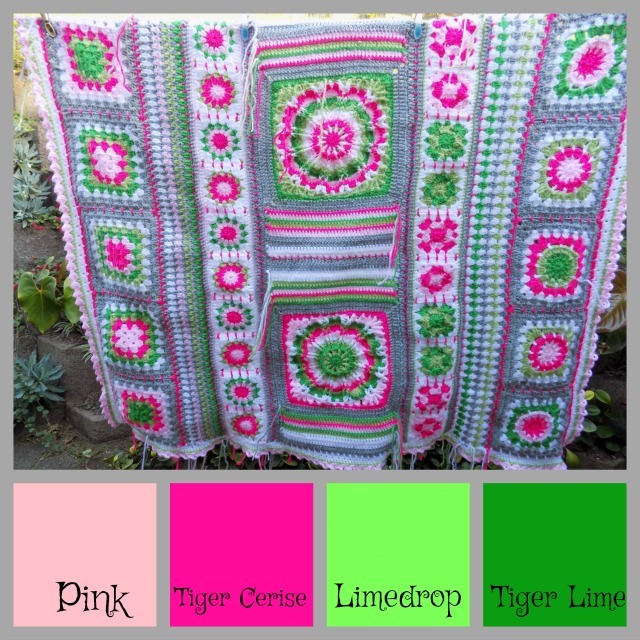 Yarn thicknesses vary somewhat from brand to brand as do the tensions of individual crocheters. The most important thing is that your tension remains even throughout the project. 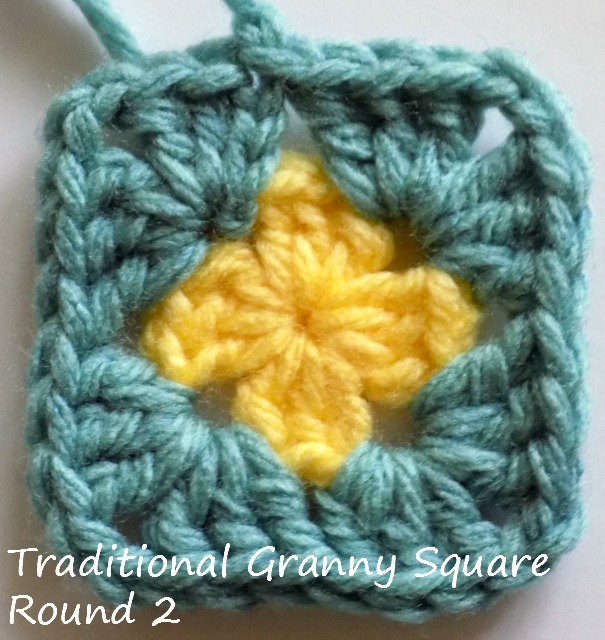 SQUARES are worked in the round with Right Side Facing throughout. Round 1: 3ch (counts as 1dc), 11 dc into ring, sl st into 3rd of beginning ch to close. Break off yarn. Round 2: Join yarn in top of any dc, 5ch (counts as 1dc, 2ch); *1dc into next dc, 2ch* repeat *to* 10 times more. Sl st into 3rd of beginning ch to close. Break off yarn. Round 3: Join yarn in any 2ch sp. 3ch (counts as 1dc), 2dc into same sp as join; *3dc into next 2ch sp* repeat *to* 10 times more. Sl st into 3rd of beginning ch to close. Break off yarn. Stitch count: 12 x 3dc groups. NOTE: In Rounds 4 to 8 your circle will increase by 12sts each round. The increase is worked alternatively into the centre stitch or centre space of the stitches between fpdc posts on each group. Round 4: Join yarn in 2nd dc of any 3dc group. 3ch (counts as 1dc), 1dc into same dc as join, 1fpdc around next dc of (third of 3dc group), 2ch; *into next 3dc group: 1fpdc around 1st dc, 2dc into 2nd dc, 1fpdc around 3rd dc, 2ch* repeat *to* 10 times more; 1fpdc around 1st dc of beginning 3dc group. Sl st into 3rd of beginning ch to close. Break off yarn. 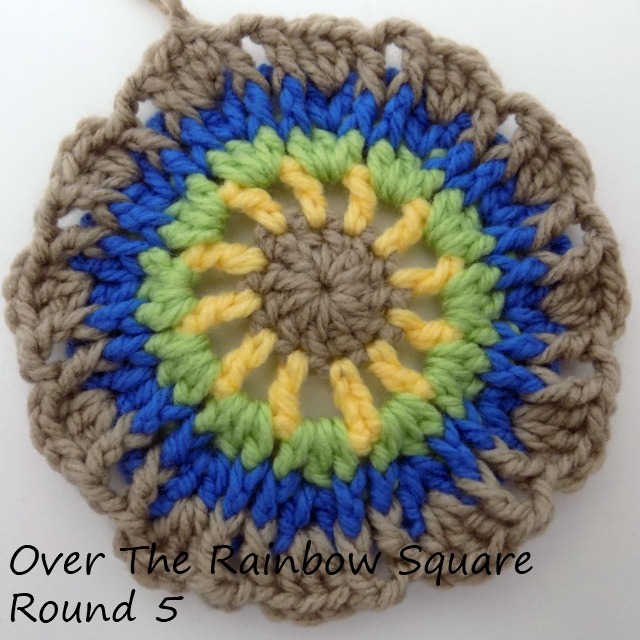 Round 5: Join yarn in middle space between the 2dc of any group. 3ch (counts as 1dc), 2dc into same sp as join, 1fpdc around next fpdc, 2ch; *1fpdc around fpdc of next group, 3dc into space between 2dc, 1fpdc around next fpdc, 2ch* repeat *to* 10 times more; 1fpdc around fpdc of beginning group. Sl st into 3rd of beginning ch to close. Break off yarn. Stitch count: 12 x (1fpdc, 3dc, 1fpdc) groups and 12 x 2ch spaces. Round 6: Join yarn in 2nd dc of any group. 3ch (counts as 1dc), 3dc into same dc as join, 1fpdc around fpdc, 2ch; *1fpdc around fpdc of next group, 4dc into 2nd of 3dc, 1fpdc around next fpdc, 2ch* repeat *to* 10 x more; 1fpdc around fpdc of beginning group. Sl st into 3rd of beginning ch to close. Break off yarn. 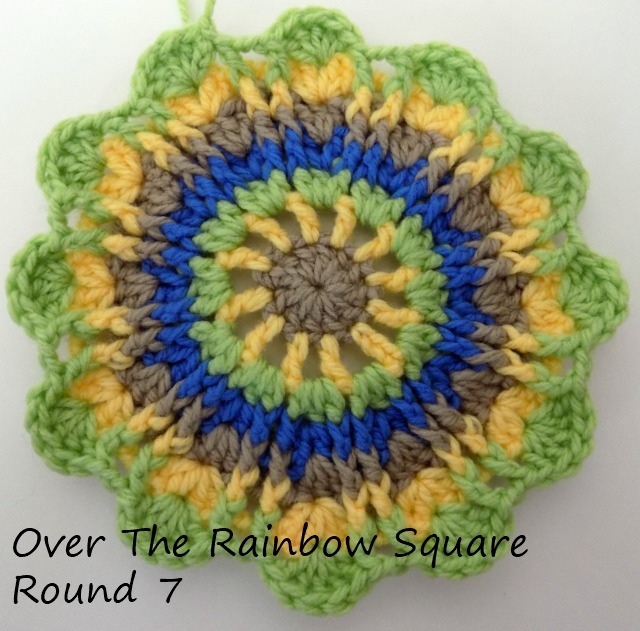 Round 7: Join yarn in the middle sp of the 4dc of any group. 3ch (counts as 1dc), 4dc into same sp as join, 1fpdc around next fpdc, 2ch; *1fpdc around fpdc of next group, 5dc into centre sp of next 4dc, 1fpdc around next fpdc, 2ch* repeat *to* 10 times more; 1fpdc around fpdc of beginning group. Sl st into 3rd of beginning ch to close. Break off yarn. Stitch count: 12 x (1fpdc, 5dc, 1fpdc) groups and 12 x 2ch spaces. Round 8: Join yarn in 3rd dc of any group. 3ch (counts as 1dc), 5dc into same dc as join, 1fpdc around fpdc, 2ch; *1fpdc around fpdc of next group, 6dc into 3rd of 5dc, 1fpdc around next fpdc, 2ch* repeat *to* 10 times more; 1fpdc around fpdc of beginning group. Sl st into 3rd of beginning ch to close. Break off yarn. Stitch count: 12 x (1fpdc, 6dc, 1fpdc) groups and 12 x 2ch spaces. Round 9: Join yarn in middle sp of 6dc group (between 3rd and 4th dc) 3ch (counts as 1dc), 5dc into same dc as join, 1fpdc around fpdc, 2ch; *1fpdc around fpdc of next group, 6dc into middle sp of 6dc, 1fpdc around next fpdc, 2ch* repeat *to* 10 times more; 1fpdc around fpdc of beginning group. Sl st into 3rd of beginning ch to close. Break off yarn. Round 10: Join yarn in 1st dc of any 6dc group. 3ch (counts as 1dc), 1dc into each of next 2dc, 1ch, 1dc into each of next 3dc, 1fpdc around fpdc, 2ch; *1fpdc around fpdc of next group, 1dc into each of next 3dc, 1ch, 1dc into each of next 3dc, 1fpdc around next fpdc, 2ch* repeat *to* 10 times more; 1fpdc around fpdc of beginning group. Sl st into 3rd of beginning ch to close. Break off yarn. Round 11: Join yarn in any 1ch sp. 2ch (counts as 1hdc), 2hdc into same 1ch sp, 3ch; 1fptrc around fpdc, 3ch, 1fptrc around fpdc; *3ch, 3hdc into next 1ch sp, 3ch; 1fptrc around fpdc, 3ch, 1fptrc around fpdc* repeat *to* 10 times more. 3ch, sl st into 2nd of beginning ch to close. Break off yarn. In the next round corners will be added to start making it square. Round 12: Join yarn in any 3ch sp between 2 fptrc posts. 3ch, 1trc (counts as 2trc tog), 2ch, 2trc tog, 3ch, 2trc tog, 2ch, 2trc tog, into same 3ch sp as join, 2ch; *3trc tog into next 3ch sp, 2ch; 3dc tog into next 3ch sp, 2ch; 3hdc into next 3ch sp, 2ch; (3sc into next 3ch sp, 2ch) x2; 3hdc into next 3ch sp, 2ch; 3dc tog into next 3ch sp, 2ch; 3trc tog into next 3ch sp, 2ch; (2trc tog, 2ch, 2trc tog, 3ch, 2trc tog, 2ch, 2trc tog) into next 3ch sp, corner made, 2ch* repeat *to* three times more omitting the last corner and 2ch. Sl st into top of beginning 2trc tog to close. Break off yarn. Stitch count: (2trc tog, 2ch, 2trc tog, 3ch, 2trc tog, 2ch, 2trc tog) into each corner. 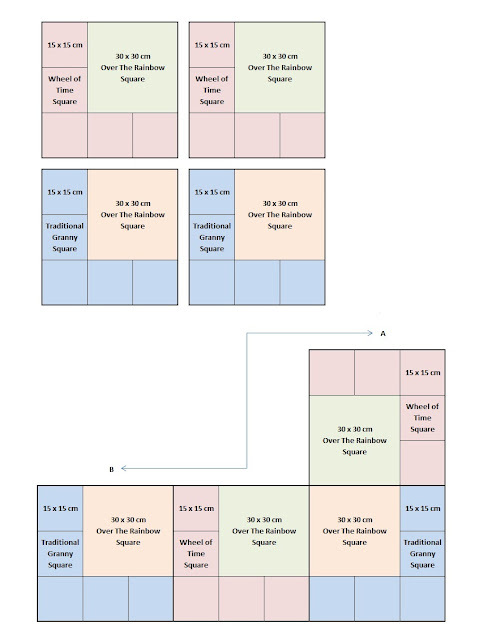 (2 x 3trc tog; 2 x 3dc tog; 6hdc, 6sc and 9 x 2ch spaces) on each side. Round 13: Join yarn in any 3ch corner sp. 3ch (counts as 1dc), 4dc into same 3ch sp as join; *(2dc into next 2ch sp) x2, (3hdc into next 2ch sp) x2; (3sc into next 2ch sp) x3; (3hdc into next 2ch sp) x2; (2dc into next 2ch sp) x2; 5dc into 3ch corner sp* repeat *to* three times more omitting the last 5dc on last repeat. Sl st into 3rd of beginning ch to close. Break off yarn. Stitch count: 5dc in each corner. 29sts (8dc, 12hdc and 9sc) on each side. Round 14: Join yarn in 3rd dc of corner 5dc, 3ch (counts as 1dc), 1dc, 2ch, 2dc into same dc, *1dc into each of next 33sts, (2dc, 2ch, 2dc) into next dc, corner made* repeat *to* 3 times more omitting corner at the end of last repeat. Sl st into 3rd of beginning ch to close. Break off yarn. Stitch count: (2dc, 2ch, 2dc) in each corner. 33dc on each side. 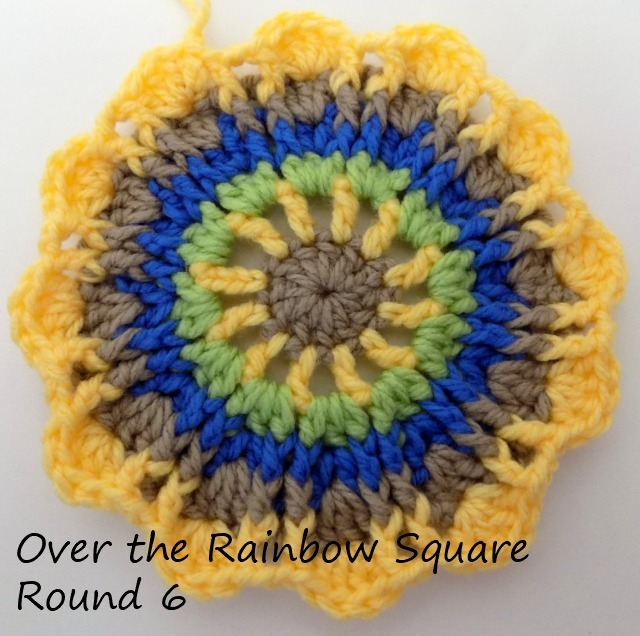 Hello lovely crocheters and welcome (at long last!) 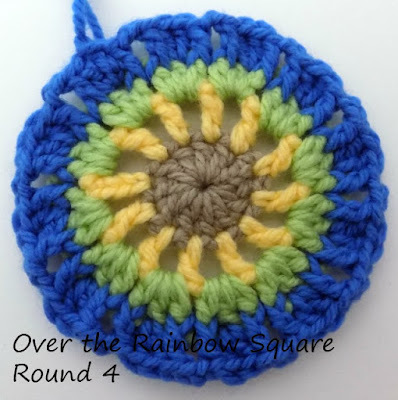 to the Kick Off of our Rainbows After the Rain (RAR) CAL, which I will be hosting along with Andrea of KOKOPELLI DESIGN! If you have already been following along you can launch right in to this post. If you are new to the CAL please read my INTRODUCTION POST first. For Part 1 of the CAL (Poncho & Blanket) we will be making TRADITIONAL GRANNY SQUARES. There was a picture in my head of the gorgeous photos I would take for this post........ and then it started raining and raining and raining (for close onto a week now!) ...... and no rainbow in sight! So we will just have to make do with the not-so-great photos previously taken. Some Woodstock photos doing the rounds on the internet really inspired me to achieve a sort of "hippie rainbow" look with the blanket and poncho. I loved tie-dying (just about every) t-shirts and cloths when I had a big outdoor craft space and a much stronger back and hands!. I also did a lot of Batik work and so the colours and design for the circular parts were a bit of a swirl of ideas from cloths and wall hangings made in my really colourful younger years! To get the tie-dye look is just a little trick of alternating lights, brights and neutrals. Think of the neutrals as the part of the cloth that are tied or waxed so they do not pick up on the dyes. Also your outer layers of the "scrunch" pick up a heavier dose of dye, and the inner "scrunch" gets a much lighter dose. 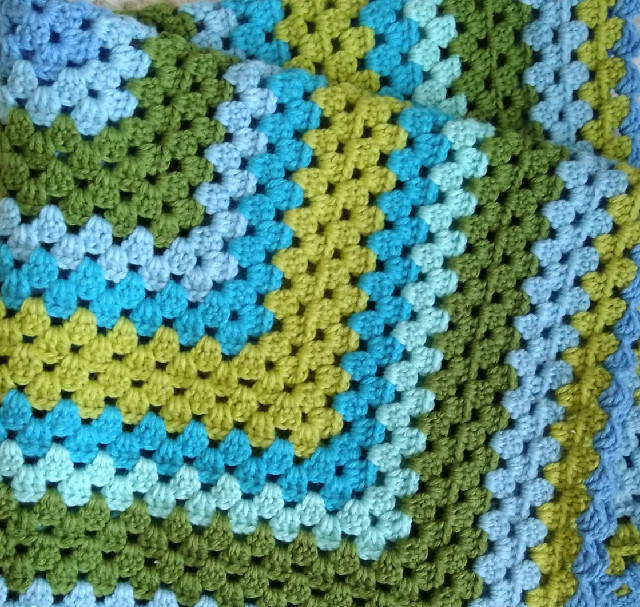 "If you’ve been reading here a while, then you’ll remember a previous crochet-a-long (CAL), ‘Wade’s Blanket’, which was named to honour a little boy who fought – and, tragically, lost – a hard battle against childhood leukaemia. That was two years ago. Wade’s family and Zelna’s family are close, and those were dark days, compounded by the loss of Zelna’s mother to motor neurone disease soon afterwards. 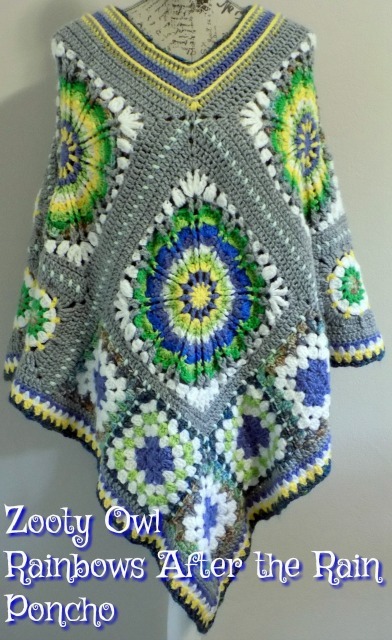 For Zelna, crochet provided some small comfort through the worst of her grief. Those of you who have lost dear ones will probably be able to relate to the raw agony and rage and confusion of those days. But what happens next? What happens after the early stages of grief – however long they last – have been endured? What happens when you’re ready to move beyond just putting one foot in front of the other, and you begin to lift your eyes from the ground, to look cautiously ahead? That’s what this new CAL is about. Nobody’s saying that grief magically goes away: of course it doesn’t. People often refer instead to making a space in their hearts to accommodate the pain, whilst carrying on. Because ultimately, we do have to carry on. Rainbow After The Rain is about rediscovering hope. It’s about accepting the feeling of the sun’s warmth on one’s skin again, as gaps begin to appear between the rainclouds. It’s about daring to believe that there may be joy and growth ahead. And it’s about giving oneself permission to seek that joy and growth. It’s about finding peace and comfort, and about rediscovering the beauty of the world. What on earth could possibly symbolise all of that better than a rainbow? 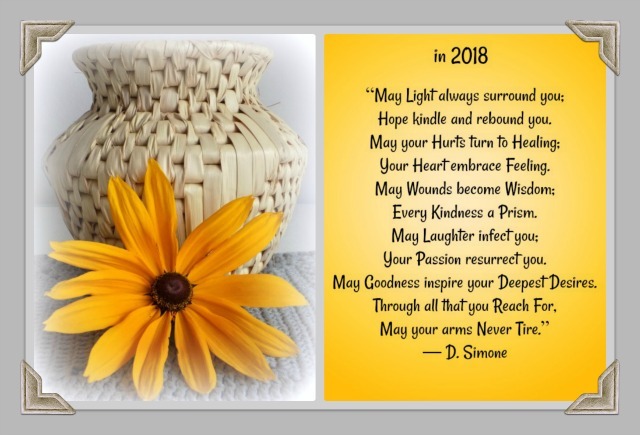 Each component of this CAL will offer a meditation on healing, with titles such as "Wheel of Time", "Ribbons of Hope" and "Somedays are Diamonds". and death a day (or maybe even less)"
To avoid confusion the Poncho and Blanket layouts will be published separately. 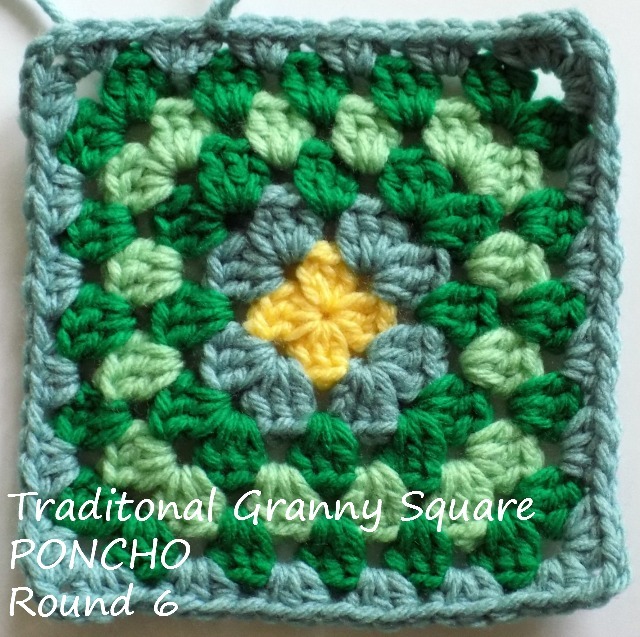 In addition some of the Poncho and Blanket Patterns will be published separately, as there are small variations in the squares. NOTE: The size of your square will depend on your choice of yarn thickness and hook size. 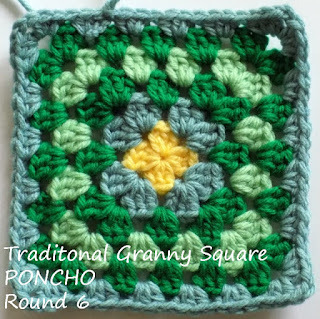 Should you choose to work exactly according to the RAINBOWS AFTER THE RAIN PONCHO layout, simply repeat the final round of the pattern until the square measures 15cm x 15cm . Gauge is not too important with this poncho. Yarn thicknesses vary somewhat from brand to brand as do the tensions of individual crocheters. The most important thing is that your tension remains even throughout the poncho. Round 1: 5ch (counts as 1dc, 2ch), (3dc into ring, 2ch) 3 times; 2dc into ring; sl st into 3rd of beginning 5ch to close. Stitch Count: 3dc each side and 2ch in each corner. Round 2: sl st into 2ch space; 3ch (counts as 1dc); (2dc, 2ch, 3dc) into 2ch space; (3dc, 2ch, 3dc into next 2ch space) x3; sl st into 3rd of beginning 3ch to close row. Break off yarn. Stitch Count: (3dc, 2ch, 3dc) in each corner. Round 3: Join yarn with a sl st in space between 3dc groups; 3ch (counts as 1dc) or crochet a standing dc, 2dc into same space; *(3dc, 2ch, 3dc) into corner 2ch; 3dc into space between 3dc groups* Repeat *to* twice more; (3dc, 2ch, 3dc) into corner 2ch, sl st into 3rd of beginning 3ch to close row. Break off yarn. Stitch Count: (3dc, 2ch, 3dc) in each corner and 1 x 3dc grouping each side. 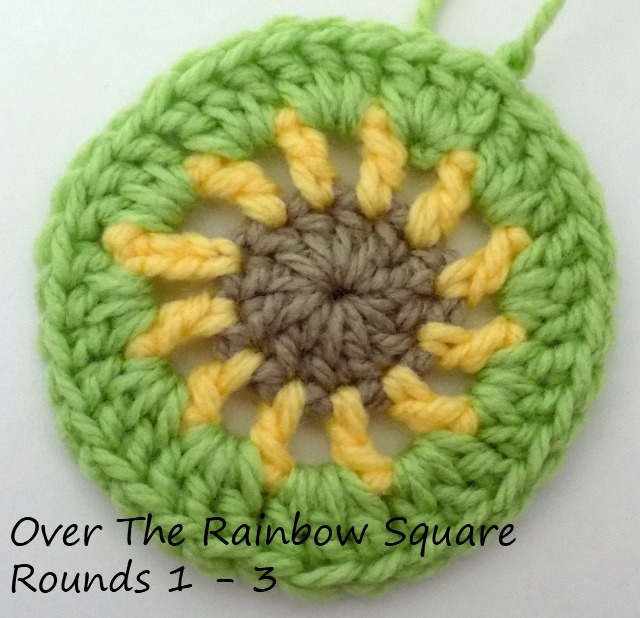 Round 4: Join yarn with a sl st in space between 3dc groupings before any corner 3dc. 3ch (counts as 1dc) or crochet a standing dc, 2dc into same space; *(3dc, 2ch, 3dc) into corner 2ch; 3dc into each space between 3dc groups to corner* repeat from *to* twice more, (3dc, 2ch, 3dc) into corner 2ch, 3dc into space between 3dc groupings; sl st into 3rd of beginning 3ch to close row. Break off yarn. Stitch count: (3dc, 2ch, 3dc) in each corner and 6dc (2 x 3dc groupings) each side. Round 5: Join yarn with a sl st in space between 3dc groupings before any corner 3dc; 3ch (counts as 1dc ) or crochet a standing dc, 2dc into same space; *(3dc, 2ch, 3dc) into corner 2ch; 3dc into each space between 3dc groups to next corner* Repeat *to* twice more; (3dc, 2ch, 3dc) into corner 2ch; 3dc into each space between 3dc groups to start 3dc group, sl st into 3rd of beginning 3ch to close row. Break off yarn. Stitch count: (3dc, 2ch, 3dc) in each corner and 9dc (3 x 3dc groupings) each side. 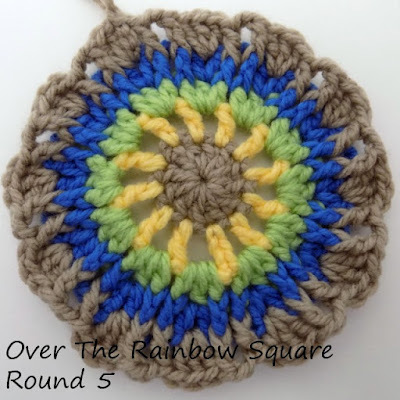 Round 6: Join yarn with a sl st in space between 3dc groupings before any corner 3dc; 2ch (counts as 1hdc) or crochet a standing hdc, 2hdc into same space; *(3hdc, 2ch, 3hdc) into corner 2ch; 3hdc into each space between 3dc groups to next corner* Repeat *to* twice more; (3hdc, 2ch, 3hdc) into corner 2ch; 3hdc into each space between 3dc groups to beginning 3ch, sl st into 2nd of beginning 2ch to close row. Break off yarn. 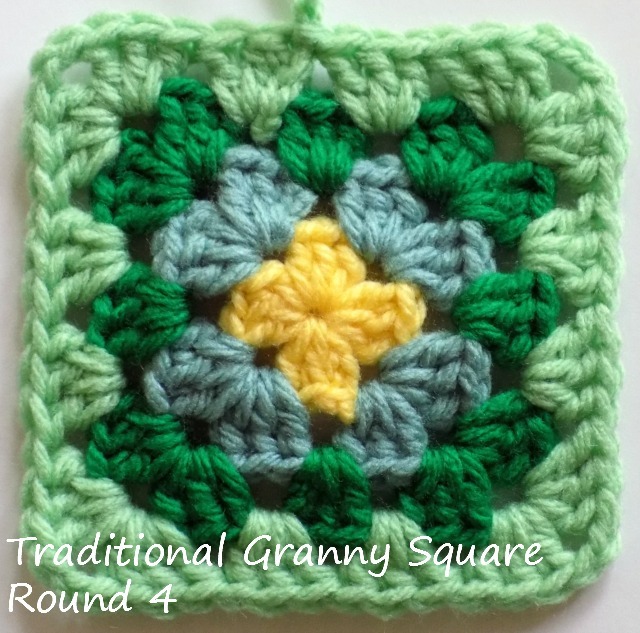 Stitch count: (3hdc, 2ch, 3hdc) in each corner and 12hdc (4 x 3hdc groupings) each side. 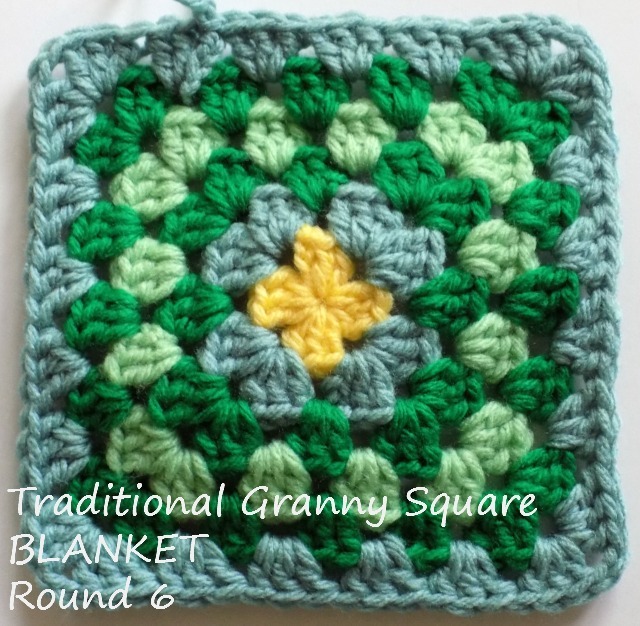 NOTE: The size of your square will depend on your choice of yarn thickness and hook size. 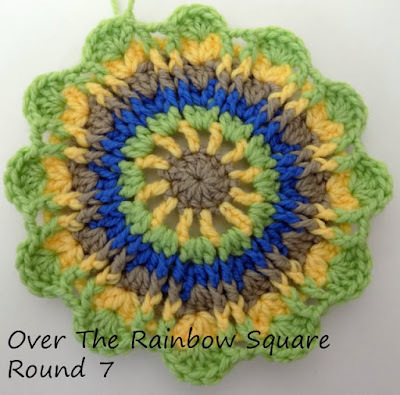 Should you choose to work exactly according to the RAINBOWS AFTER THE RAIN BLANKET layout, simply repeat the final round of the pattern until the square measures 20cm x 20cm. Gauge is not too important with this blanket. Yarn thicknesses vary somewhat from brand to brand as do the tensions of individual crocheters. The most important thing is that your tension remains even throughout the blanket. Round 3: Join yarn with a sl st in space between 3dc groups; 3ch (counts as 1dc) or crochet a standing dc, 2dc into same space; *(3dc, 2ch, 3dc) into corner 2ch; 3dc into space between 3dc groups* Repeat *to* twice more; ( 3dc, 2ch, 3dc) into corner 2ch, sl st into 3rd of beginning 3ch to close row. Break off yarn. Stitch count: (3dc, 2ch, 3dc) in each corner and 12dc (4 x 3dc groupings) each side. Stitch count: (3dc, 2ch, 3dc) in each corner and 15dc (5 x 3dc groupings) each side. Stitch count: (3dc, 2ch, 3dc) in each corner and 18dc (6 x 3dc groupings) each side.